$50 Visa Gift Card Giveaway | A Savings WOW! So you blew your budget last year. Well, it’s 2014 – your chance for a fresh start and to stick to your budget again in the new year. Favado, your friendly neighborhood grocery savings mobile app from Savings.com, can help you do just that. Personalized just for you, the Favado money-saving app will help you keep your resolution to save on groceries this year with step-by-step weekly goals from the best money-saving brains in the business. 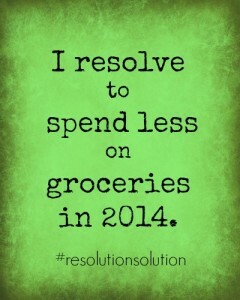 It’s the solution to keeping your 2014 resolution! We’ll be talking mostly about the little habits you can change while shopping that can make a big difference in your grocery spending…such as not buying the magazines off the rack at the checkout, writing a grocery list and sticking to it while shopping, as well as checking unit prices and sale expiration dates. Favado Helps by…allowing you to have a shopping list in the palm of your hand that you won’t forget at home! To enter, complete the mandatory entry in the Rafflecopter form below. Complete the other optional entries for more chances to win! Disclosure: This giveaway is sponsored by the Favado App. Please see our disclosure policy for more information. My favorite feature is the Price Comparisons for Best Deals at Your Local Stores. I like that they select sales and coupons from more than 65,000 grocery and drugstores nationwide. I like the Shopping List with Available Coupons & Sharing Options feature. I like the Price Comparisons for Best Deals at Your Local Stores. That’s so much better than trying to search online or go from store to store. It sends you sales alerts! Price Comparisons for Best Deals at my Local Stores. I like the sales alerts. I love how this app can help you save up to 70% on your favorite brands. I like the sales alerts! My favorite feature of the Favado app is that price compares for the best deals at my local stores. I love how you can get alerts when brands you love go on sale! That is awesome. I like the price comparisons feature. I like the Price Comparisons for Best Deals at Your Local Stores. You can “personalize” to see just the deals and coupons on products you like…by brand or by product type. I like seeing the sales. I love the coupons and I also like that you can comparison shop. I like the way is does price comparisons of different stores to help you find the best deal in your area. luv their sales ‘n coupons. My favorite feature is the price comparison for local stores. The fact that I wont ever forget my shopping list again is highly appealing, since I forget it pretty much every time. I like that this app will find the best deals on my favorite products. My favorite is the price comparison. Love the Price Comparision feature. So handy! I like that it gives you price comparisions for best deals at your local stores. I love the Price Comparisons for Best Deals at Your Local Stores. Like most of the others, I like the Price Comparisons. I like that you can compare prices among competing stores. The price comparisons sound great! My favorite is being able to see sales at multiple local stores. I like the price comparisons. To be able to comparison shop while in the store! I like that you can see coupons and sales for over 65000 stores in one place! The local store price comparisons are very useful. The price comparisons between stores is my favorite feature of the Favado app. I like the Price Comparisons for Best Deals at Your Local Stores feature. That you can personalize it. I like the tons of available coupons at grocery stores. I love all of the useful tips! I love the price comparisons between your local stores! I like how you can personalize for your needs. I like the price comparison and deal alert features. I like the price comparison the best ! I love that I can compare two or more stores. I love the shopping list feature with coupons. How convenient is that?! I really like the price comparison, and the coupon section. I love the price comparison tool, definitely helpful and what I would use the most! I like the price comparisons and coupons. I like that it’s personalized and you can compare prices between your favorite stores. i like Price Comparisons for Best Deals at Your Local Stores. I love the way the Sales Alerts would save me time, would help me make better price choices. I like that you can compare prices! Easy to find price comparisons! The sales alerts are a good thing all about saving. I like the price comparisons between stores. I shop at several stores and this could really save me some time. My fave is the price comparisons at local stores. Anything about it is awesome! The fact that it can help me save money while I’m grocery shopping is definitely key. I love that you can compare prices between grocery stores before you shop. My favorite feature is the price comparisons for best deals. I like that you can get notifications when your favorite items go on sale. I like the Price Comparisons for Best Deals at Your Local Stores – anything to make savings money on groceries easier! I like how I can save a lot of money. My favorite is the price comparisons for deals, I would use it a lot. I love that I can bring all the sales and savings tips with me on my mobile app right to the store! My favorite is the price comparison feature. The price comparisons! That way you don’t have to drive around everywhere or compare their sales circulars side by side. I like the price comparision feature of the app. I think the personalization would not only be nice but be a big time saver which would be nice. I like that you can search for Deals on What You Need. Sounds like a very useful app. I like the price comparisons! The price comparison tool is what I find most helpful. I like that I can search for exactly what I am looking to save on and it will help me find the best price in my area. I like the sales and coupon feature on the app. I like the Price Comparisons for Best Deals at my Local Stores. The way you can personalize it to match your personal needs! My favorite feature is being able to save a lot of money by comparing prices at different local stores. This would work great for my family. I like that you can search for deals on items you want. I like the price comparison feature. I like that I can personalize the deals shown to me. Compare prices — i like that best. I like that they will show you the ‘secret sales’. I don’t like it that it isn’t on the Kindle Fire, the only device I have. I also wish it was on the computer. That would be nice as well. The price comparisons – i LOVE a good deal. I like the price comparison of products in local stores. I love the shopping list most! My favorite feature is that you can Personalize the Deals You Want to See, So You Never Miss a Deal on Products You Love. My favorite feature of the Favado app is that I can get Complete Sale Details, including Sale Prices & Available Coupons that Reveal the Deepest Discounts. My favorite is the price comparison’s at the local stores. I love that it will help me save me money by letting me know when something I want to buy goes on sale! I like that it notifies you about sales. I really like how pinterest does that too so I can imagine its benefits for stuff I’d buy all the time. Although I’ve never used the app, I like the idea of the price comparison feature! Really cool! Thanks for the opportunity to win. I love that the coupons are corresponding to the insert that comes in the Sunday newspaper. Price Comparisons for Best Deals at Your Local Stores. I love the notification of sales on favorite items. Sometimes I’m too busy to look. I like that you can search for deals on what you need. I love that it can help you save up to 70% on your favorite brands!! Favorite feature —> the Favado app allows you to easily compile a Shopping List with Available Coupons for your specific geographical area; also it has Sharing Options. I love that I won’t have to worry about leaving my shopping list at home! I really like that you can personalize the deals you want to see. The Price Comparison feature is my favorite.